Went out today, had to go to two birthdays (one for a 4 year old, one for a 60 year old) and in between managed to fit in a visit to Metro Hobbies in Box Hill. And came home with this. I wish hobby shops also sold Tanqueray gin, but perhaps for the sake of my bank balance it is a good thing that they don't. 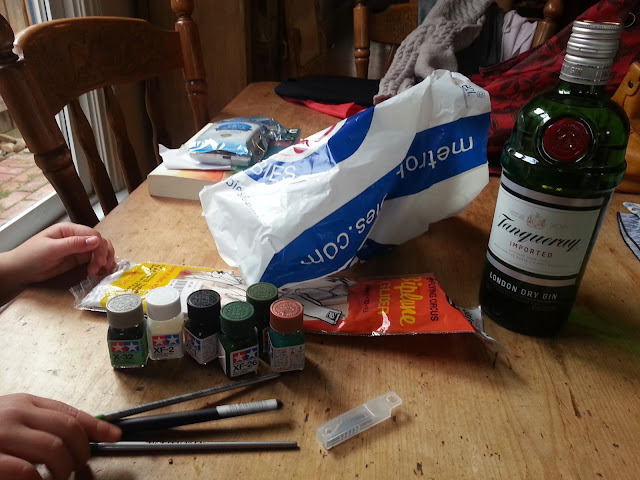 So with new paints, new precision 000 paintbrushes (including one quality sable brush), new scalpel blades, and new ingredients for mixing martinis, I feel ready to tackle anything.